Most Federal agencies received slightly better grades Wednesday for their progress under the Federal Information Technology Acquisition Reform Act, according to the annual scorecard released ahead of a hearing on Capitol Hill. 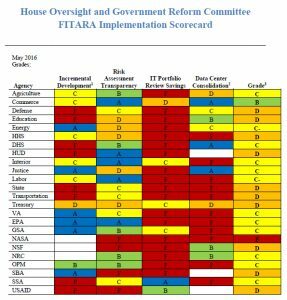 The scorecard, released today by the House Oversight and Government Reform Committee’s IT subcommittee, showed that although fewer agencies received failing grades compared to the first scorecard issued in November, most recorded only marginal improvements in meeting the requirements of FITARA. “Today, I am pleased to see moderate improvement in the grades from the first scorecard,” said Rep. Will Hurd, R-Texas, chair of the House IT Subcommittee. This year, NASA received the only F for its overall grade, although the vast majority of agencies received an F in at least one of the four areas measured under FITARA—incremental development, risk assessment transparency, IT portfolio review savings, and data center consolidation. Only the Commerce and Treasury departments received all passing grades. The General Services Administration fared worse, moving from an overall grade of B last year to a C this year, due to a failing grade in data center consolidation. But GSA is not alone in its data center woes. A recent MeriTalk report, titled “Flash Forward–The Future of the Federal Data Center” and underwritten by Pure Storage, asked 150 Federal IT/data center professionals to predict and examine the future of Federal data centers. Only about half of the respondents said their agency would be FITARA compliant by 2021, while 55% of Civilian agencies believed they would comply with the Federal Data Center Consolidation Initiative (FDCCI) by 2021. No agency received an A on the FITARA scorecard. The Commerce Department, however, scored the highest overall grade with a B.
Rep. Gerry Connolly, D-Va., one of the architects of the FITARA legislation, said although he is encouraged by the progress noted in this year’s report he remains concerned about the performance of NASA. “It’s also puzzling that the government agency with arguably the most innovative and technologically demanding mission continues to receive the lowest marks on the scorecard,” Connolly said. Of particular note in this year’s grade report by the Government Accountability Office is the difference between the risk ratings assigned to major IT investments by the Federal CIO and the ratings assigned to those programs by GAO auditors. In his testimony to the committee, David Powner, the GAO’s director of IT management issues, said the Federal CIO and agencies are understating the risk associated with major IT investments. According to GAO, at least 41 agencies are not updating the IT Dashboard on a frequent enough basis; several are taking too long to issue risk ratings and, therefore, their current risk assessments are based on old data; and at least seven agencies did not use active risks and may have overstated the likelihood of success.